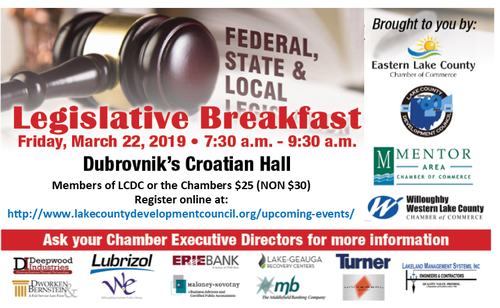 The Legislative breakfast is done in partnership with Eastern Lake County Chamber of Commerce, Mentor Area Chamber of Commerce, Lake County Leadership Development Council, and Willoughby Western Lake County Chamber of Commerce. Enjoy an informative opportunity with our elected officials to get first hand updates on policies and legislation that impact you, area business, and all of Lake County. Lively Q & A to follow.